Gold suffered a significant drop on Monday after bottoming at $1183 per ounce, breaking the 4-day range. During the NA session, the price tried to recover but failed as prices are still trading below the $1190 level. Higher US yields was the main reason for Gold to free fall breaking the negative correlation with the USD/JPY pair. The yen strengthened amid risk aversion but not Gold which was hit by the reserve ratio cut from the Chinese central bank. 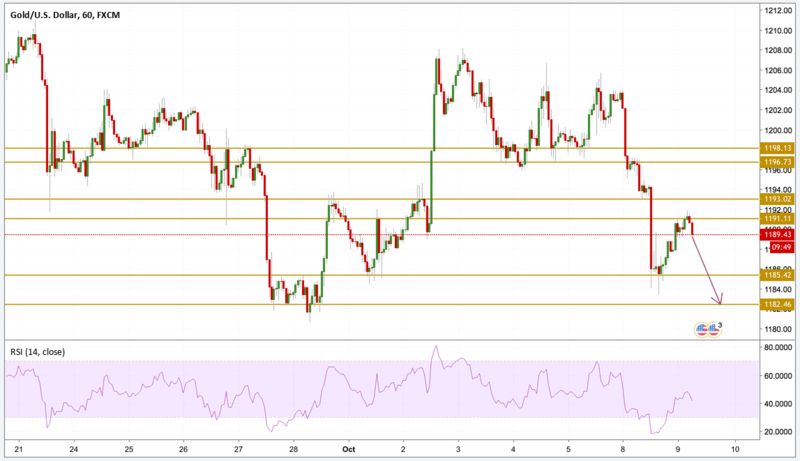 Gold prices fell during yesterday's session hitting a one week low at $1183 and then recovered a bit after entering into extreme oversold conditions. Momentum is still bearish and the price still cant hold above the $1190 level. With the bias being on the bearish side, we will be focusing on the $1182.50 support level before we can see a correction.